The Japanese believe it is Important to be harmonious with man and nature. 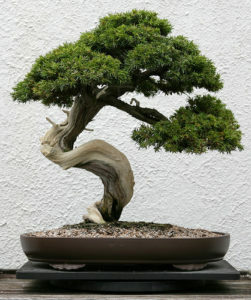 A Bonsai tree is viewed as a work of art. So, the container can enhance or detract from the tree. Ideally, it should compliment the tree. It is important that the tree have a sense of balance in the container to enhance its beauty and symmetry. If all of the elements work together the tree in the container will resemble a work of art. But, there are practical considerations that are first and foremost. The pot size must be able to support the weight of the tree so that it does not fall or tip over. Bonsai trees are generally displayed on mantles or tables so make sure the tree is balanced in the container and is not top heavy, so that it could easily tip over. Consider the overall style of the tree and what container would compliment it. Make sure the container works with the overall flow of the tree. If the tree has been designed to cascade make sure the container will support and allow this so that the tree can dip below the lip of the container.